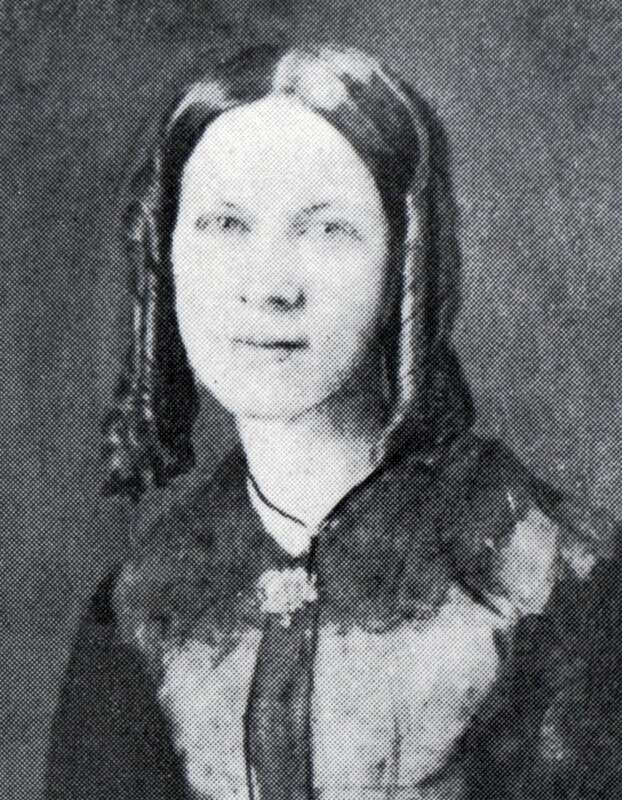 Susan Biglow Bittle, self portrait, c. 1860. Married to Rev. Daniel H. Bittle, Principal of Western Carolina Male Academy/North Carolina College 1853-1861. With the outbreak of the Civil War, Rev. Bittle requested dismission from the North Carolina Lutheran Synod on October 8, 1861. The Bittles decided it was best to leave North Carolina. The couple moved to Austin, Texas where they ran a school for young women until the end of the war. Rev. Bittle was again called to Roanoke College where he stayed two years, and then to Shepherdstown, West Virginia where he served four years. In October of 1871, he assumed charge of the Lutheran church in Savannah, Georgia, where he died on January 14, 1874 at the age of 54. In later years, Susan Bittle remarried and lived in San Francisco, California. After the death of her second husband, Rev. Abraham Myers, she continued with her art and work in the church, but lost everything in the great earthquake of 1906. She wrote in 1897 that, “The happiest part of my life was spent as Dr. Bittle’s wife, and in the dearly loved Southern states.”Susan Biglow Bittle Myers died in 1907 at the age of 78 in San Luis Obispo, California where she lived with her brother. I write this with apologies. In 1958 my father purchased the house in Mt. Pleasant designed by Susan Bigelow Bittle and built abt 1859-60. She and her husband lived in the house for only about two years before they left Mt.Pleasant. The house was solid, but the foundation was unsafe and my Dad could not get the financing to move the house. He decided to tear it down. No one knew much about how the house was built and to everyone’s amazement, the walls were built by stacking (flat sides down) hand hewn 2×4’s. The sections were connected by a kind of tongue & grooved system linking the stacked 2×4’s. Hand hewed nails were used. It was a fantastic design and everyone, including my Dad, regretted the loss. The ECHS museum has several photos of the house which later became a dorm for MPCI. 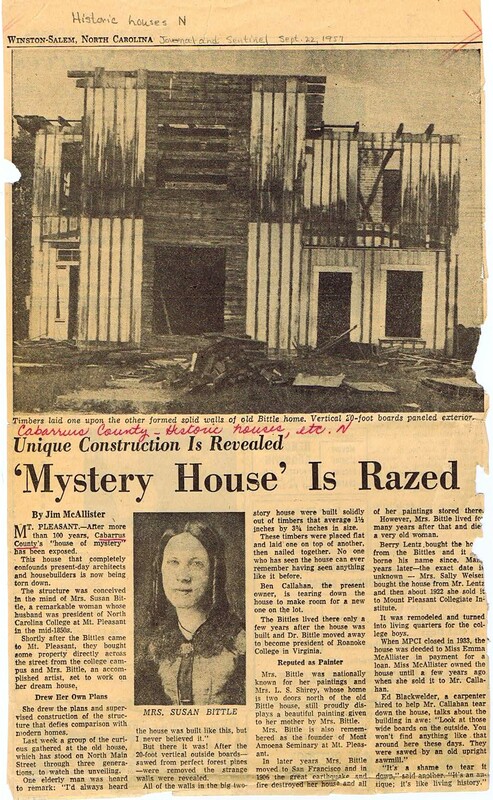 There is an 1958 article in the Concord Tribune about the house being torn town (with photos). Copy is in George Hahn’s Eastern Cabarrus History. History of the Bittle House in Mount Pleasant, designed by Susan Biglow Bittle in the 1850s. Winston-Salem Journal and Senitnel, Sept. 22, 1957.